Festive season is here !! Spirits are high !! Will is strong to make something sweet for my family but not enough time on hand. Is that your life story too? Don’t you worry my Condensed Milk fudge comes to the rescue in such situation. Only 3 main ingredients and 5 minutes is all you need to make an easy dessert . And the possibilities are endless. No stove top cooking required for making this fudge . Just one bowl and a simple microwave does the trick. I promise that this fudge is as rich and delicious as the traditional fudge recipes. Microwave 10 minute Double chocolate walnut fudge recipe. If you are not a Microwave fan , feel free to make them on the stove top. Instructions given in the recipe. I have been contemplating over many recipes this past month. Wanted to share so many recipes with you guys !! Especially Ras Malai , Malpuas and Jalebis. But yes there is always a but!! This past year have been so hectic with my baby. It’s as if I am competing with time. Cooking daily meals is overwhelming and I can barely manage it. Cooking, taking photos , writing is a lot of work but that’s the only way to connect with a sweet audience like you. After a long crazy day with two kids, daily chores when I open my laptop and blog I feel so satisfied. Sharing is my way to unwind. Thank you for being a part of my world! Coming back to this super easy fudge recipe. Traditionally the old-fashioned fudge is made by stirring in milk, sometimes evaporated milk , chocolate / cocoa , sugar flavoring in a sauce pan. Cooking it on a low flame . This method requires constant stirring so that the mixture doesn’t burn and avoid crystallization of sugar It also requires to cook the fudge mixture to a certain temperature. Hence you will require a candy thermometer as well to make old-fashioned fudge. Some recipes even use marshmallow cream to make fudge. Good new is that Condensed milk fudge requires only 3 main ingredients for the base. No thermometer or pro candy making skills needed here. Fudge can be done in a microwave or on a double boiler within minutes. No constant stirring required to make fudge using condensed milk. There are so many fun and delicious variations you can try using this basic white chocolate fudge recipe. GET CREATIVE with fudge flavors and add ons . You may fold in some nuts, dried fruits, chocolate chips, pretzel bites, cereal , caramel bits in the fudge base. You can even try different flavoring other than just vanilla. I love lemon extract, any fruit extract, peppermint extract , citrus zest . You can color white chocolate fudge with oil based color or adding dried food grade powder . Do not use any water based food color or purees as it will seize the chocolate. Go natural and use a bit of turmeric for yellow, matcha for green . You may use freezer dried fruit powder that are readily available in super market. Have fun with vibrant colors from beet, pitaya , blueberry, raspberry powder and many more. Choose from wide variety like pumpkin spice, chai spice, lavender , pepper , saffron , cardamom. Ideas and possibilities are endless here. You are just limited by your imagination. 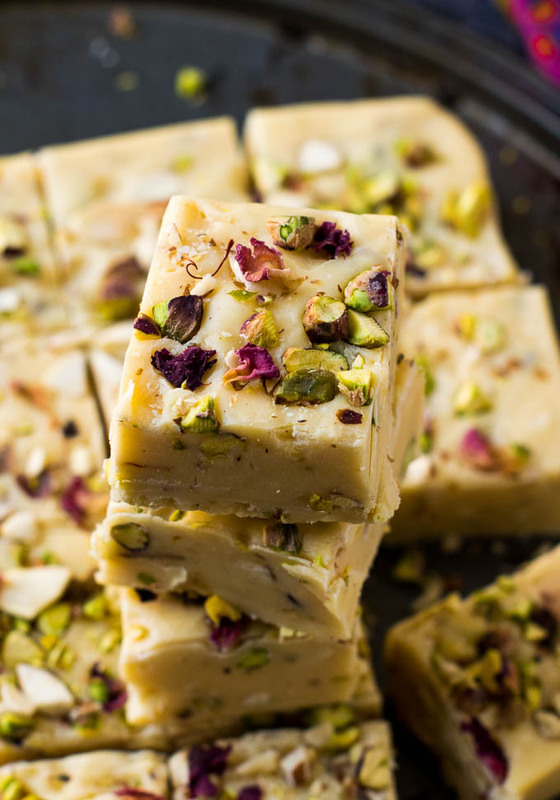 Today I will show you how to make this Indian fudge aka burfi using condensed milk fudge as a base. It’s a Indian fusion sweet recipe. 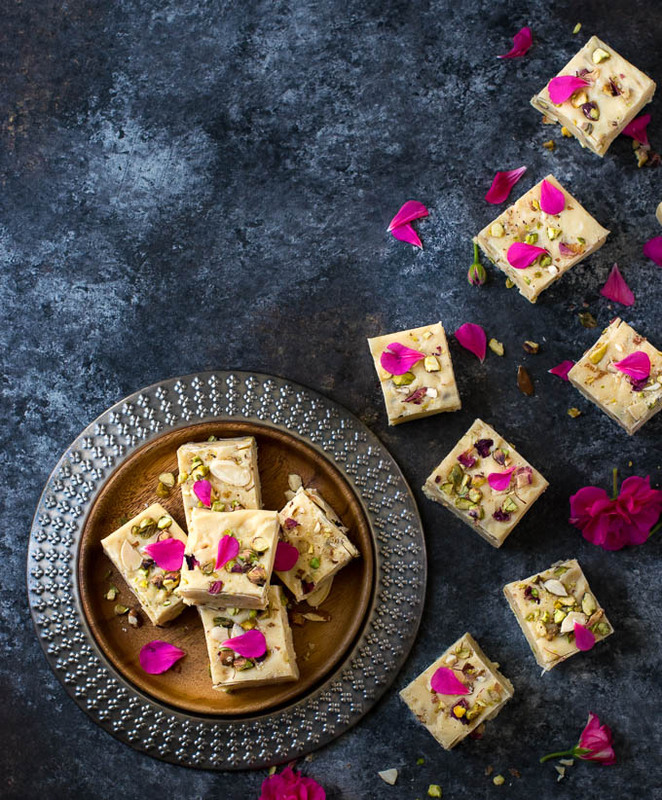 It is so easy to make Burfi with condensed milk and tastes absolutely rich and delicious just like the traditional one. 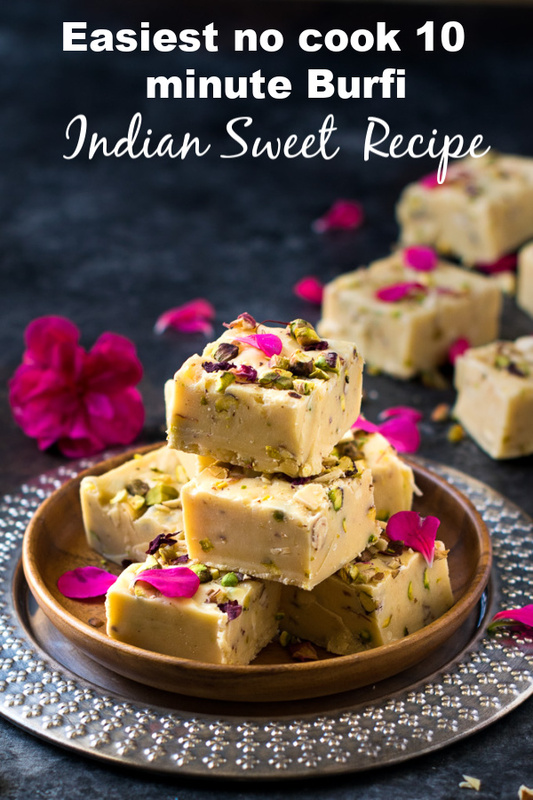 I have added Indian popular spice mix Thandai powder to make this Indian style fudge. Thandai powder is made of ground peppercorn, cardamom, fennel, melon seeds, poppy seeds , rose petals. It’s actually consumed as a drink by mixing it in milk and served chill on hot summer days. Holi – Indian festival of colors actually marks the beginning of Thandai fever. 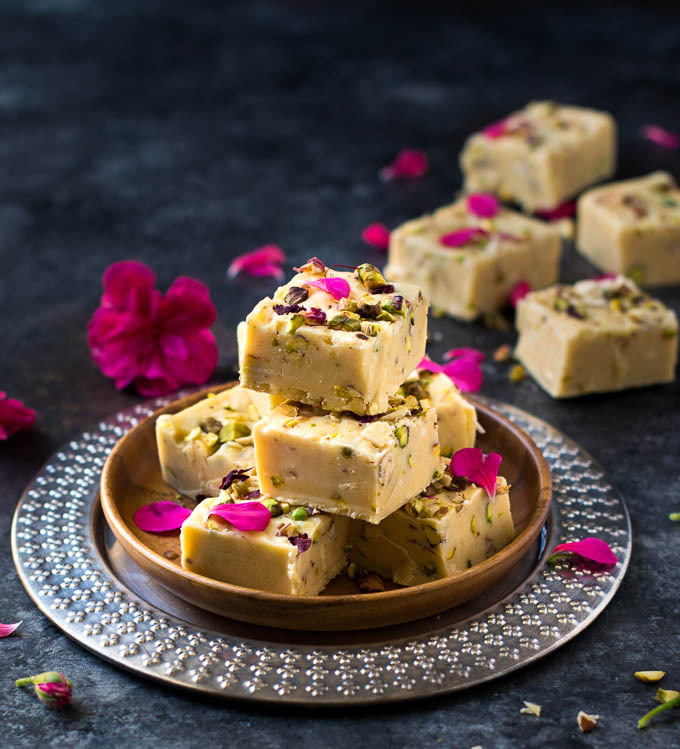 So when I made this easy burfi recipe for Holi, I thought why not share this Indian Fudge recipe with you. What I like about this recipe is balance of flavors. As white chocolate fudge is really sweet the Thandai powder spice mix really cuts that sweetness. If you do not have thandai powder mix you may add a little bit of each ingredient separately. If all ingredients are not available then a little black pepper, cardamom, saffron, fennel will do .It works like a charm!! Do top it with some roasted chopped nuts . Fudge makes great edible gifts for your friends and family. It is even cheap on the pocket and budget friendly sweet. Most importantly a big batch of this fudge comes together in 10 minutes and no mess. How long will condensed milk fudge last? Condensed milk fudge will last about 2 weeks at room temperature in an air tight container and about a month if refrigerated. You may individually wrap each fudge piece, place it in an air tight container and freeze it for 3-4 months. 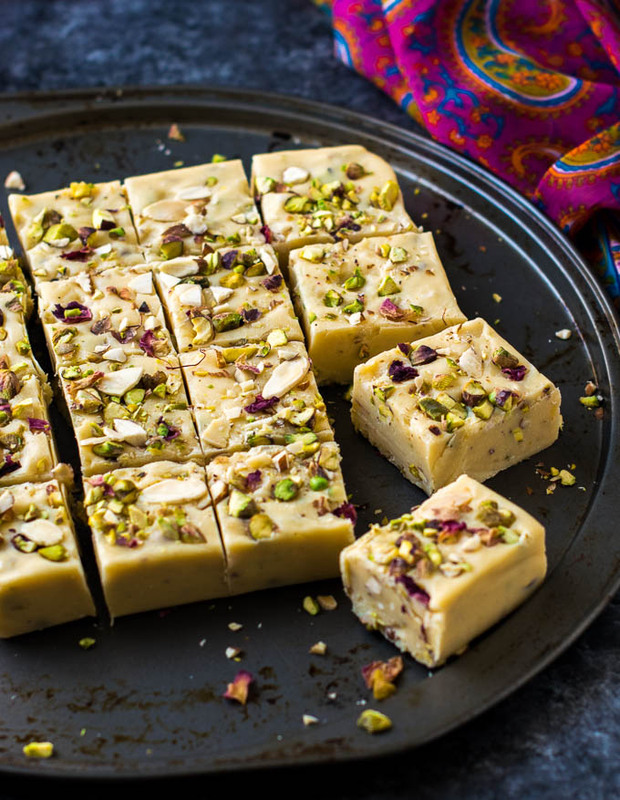 How to make quick and easy burfi with no cook microwave method? All you need to do is combine sweetened condensed milk and white chocolate in the microwave and melt it together. Stir in your favorite toppings and set it in desired mold. How does fudge taste ? It is firm to hold but once you bite into it , it just melts in your mouth. Fudge tastes rich and delicious in every bite. As I have added Indian spices and flavoring it tastes exactly like a burfi but made in a super simple way. The fudge recipe that I am sharing with you today is not too soft and not too hard. I feel it’s just right . 1/4 cup less chocolate for softer fudge. 1/4 cup more chocolate for a harder fudge. DID YOU LIKE THIS RECIPE ? Don’t forget to give a ★ rating. Just click on the stars in the Recipe below to rate!!! Given below is the base recipe of White chocolate fudge followed by how I made a variation using Indian spices (Thandai Mix). 3 main ingredients and 5 minutes prep time is all you need to make this rich and decadent fudge. This fudge recipe has endless variation. Get creative! Makes great edible gifts or last minute treat for pot luck and parties. 14 oz i.e One can Sweetened condensed milk not evaporated milk . Line a 7 or 8 " square pan with parchment paper or wax paper. Double line it for easy removal of the fudge. In a Microwave safe bowl heat up condensed milk for 1 minute. This will loosen it up a bit. Now stir in white chocolate to the same bowl. Microwave white chocolate chips and the sweetened condensed milk together on high for 1 minute, stirring every 30 seconds until chocolate is completely melted. Take it out of the microwave. Let it stand for 5 seconds and gently stir. Repeat the process of microwaving in 30 seconds increment until the chocolate melts completely and the mixture is smooth. Give a light stir after each 30 seconds. It took 3 minutes in total to melt the chocolate chips. Once melted add in the desired flavoring. Scoop the mixture in the lined pan and level it with a spatula or back of a spoon. Top it with any reserved toppings if desired. Cover it with cling wrap or foil and place it in the fridge to firm up for 3-4 hours. After it is set, take it out of the pan and with a sharp knife cut into squares. Add Thandai powder to the sweetened condensed milk in step 2 after you warm up the condensed milk for the first time. Stir / whisk until lump free. For rest follow the procedure above. Check out my other delicious dessert recipes here . For variations, possibilities, topping ideas refer to the details in the post. Make 48 servings 1" pieces . Store the fudge in airtight container at room temperature for up to 2 weeks or in the fridge for up to 4 weeks. You may individually wrap each fudge piece, place it in a air tight container and freeze it for 3 months. Then cook it in a sauce pan on a low flame stirring often to avoid any burning or sticking of chocolate at the bottom. Alternatively you may use a double boiler method to melt the fudge mixture. I have added saffron, cardamom, black pepper in addition to thandai powder which elevates the taste of the fudge even more. Black pepper cuts the sweetness of the fudge. It’s completely optional. Never miss a recipe . If you like being here do subscribe to my blog.Make sure you have us in your contact list so that the recipe does not land in spam folder. Carveyourcraving(at)gmail(dot)com . Happy cooking!!! Do share it with the world!!! You may use Morde Lina. Hi love the recipe!! Can you tell me a good quality indian cooking chocolate for both white and dark chocolatess? Thank you! Hi Nikki , walnuts almonds , pistachio …. any nuts nuts, dried fruits like dried orange, pineapple or cranberries go well. Even chocolate chips . You may add orange zest too. I have given a list of add ons in my post. You may refer that. Not more than 3/4 cups. You can use 1/2 cup initially and eyeball . If you wish add more. Love this recipe! Could you suggest flavourings/add ons that go well with dark chocolate? Also if making the dark chocolate fudge, what could be the quantities of add ons? Waiting to try out this recipe.